Bring a little flair to your home with a new kitchen – probably the most used room in your home. Whether you are thinking of a traditional country kitchen or something contemporary, we can help you. We can design and install made-to-measure kitchens to suit your budget, your home and your personal taste. Our kitchen furniture is superb quality and is fitted professionally and with great care by our own team of experienced fitters. 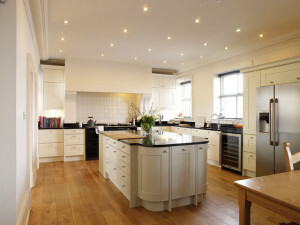 Our “one-stop-shop” service option means that we can even manage the whole project for you, if you wish, from start to finish: advice and design, made-to-measure manufacture, removal and clearance of the old kitchen, electrical, gas, plumbing, plastering, tiling, flooring, fitting of new kitchen and appliances to the highest standards.